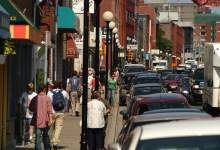 The City of St. John's maintains a road network of over 1,400 km, as well as a network of sidewalks for pedestrians and parking infrastructure throughout the City. In this section you can find out important information about topics like snow clearing, street cleaning and downtown parking. The City is also actively working to make our roads safer through programs such as Traffic Calming and the Neighbourhood Speed Watch Program. This page now redirects to City Services Snow Clearing.